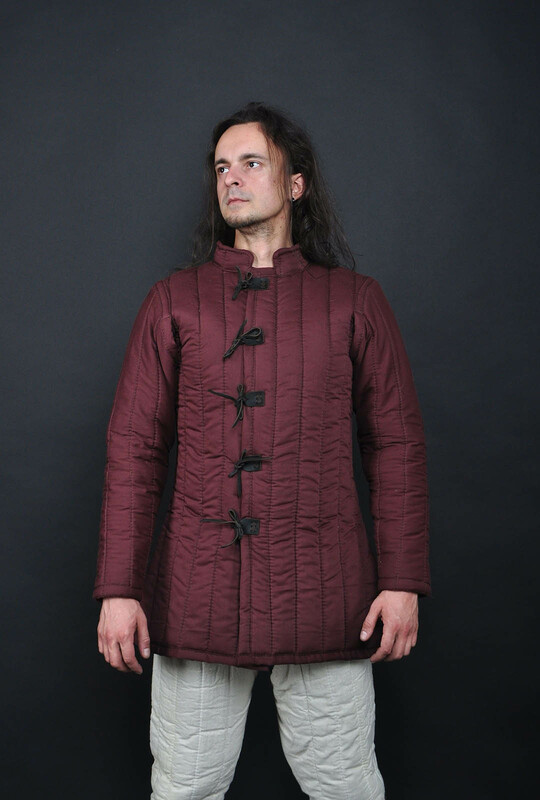 This simple and popular model of gambeson of XI-XV century is suitable for usage for both, men and women. This is standard model with black leather fastenings and standard sleeves. 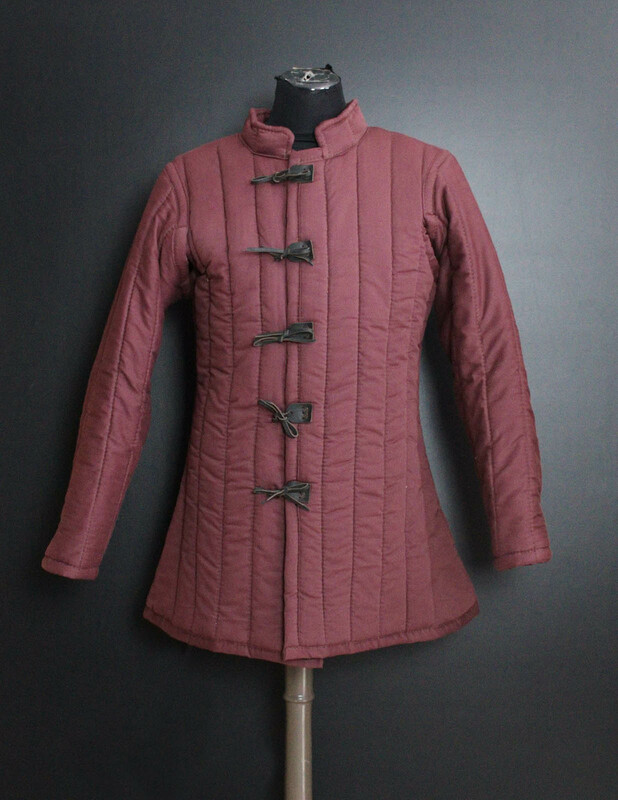 We designed this model of gambeson specially for women.Gambeson is not historically correct, but it is very comfortable, because it's cut for female forms. 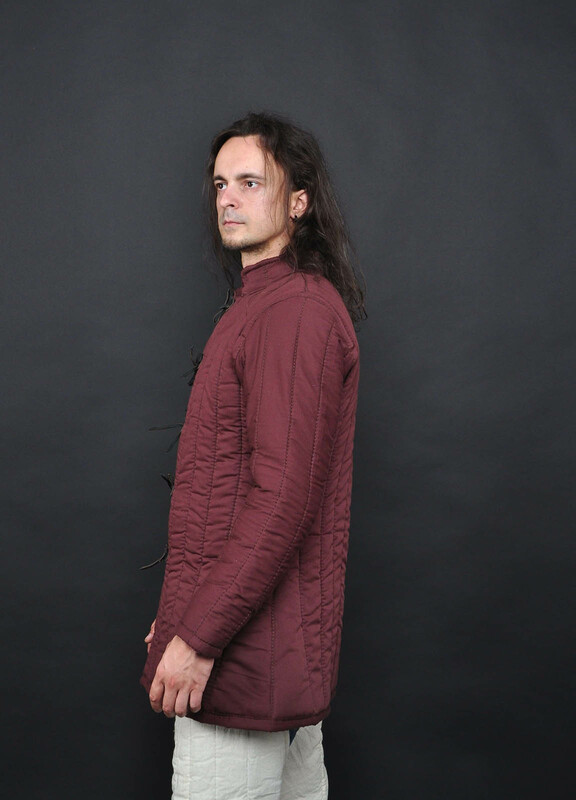 Fastenings: brass buttons.Attaching of the sleeves: standard Outer side: brown cottonInner side: uncolored cottonLayers of padding: 3 layers Length of the gambeson - 80 cm (31,5 inches)Length of the sleeves - 55 cm (21,6 inches)Length of the shoulder - 16 cm (6,2 inches) Сhest - up to 92 cm (36,2 inches)Waist - up to 80 cm (31,5 inches)Hips - up to 95 cm (37,4 inches) ..
Gambeson with firm leather straps for fastening from the front. 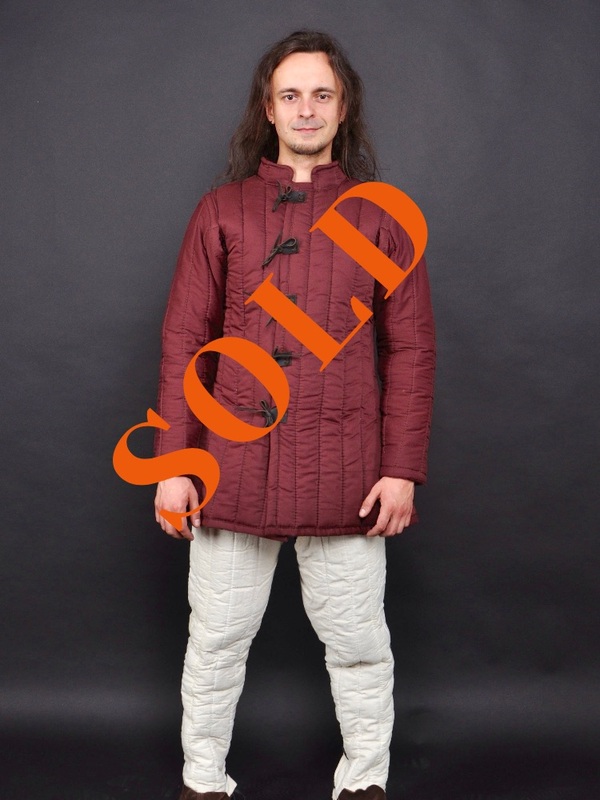 Such model of gambeson was very popular in XI-XV centuries. 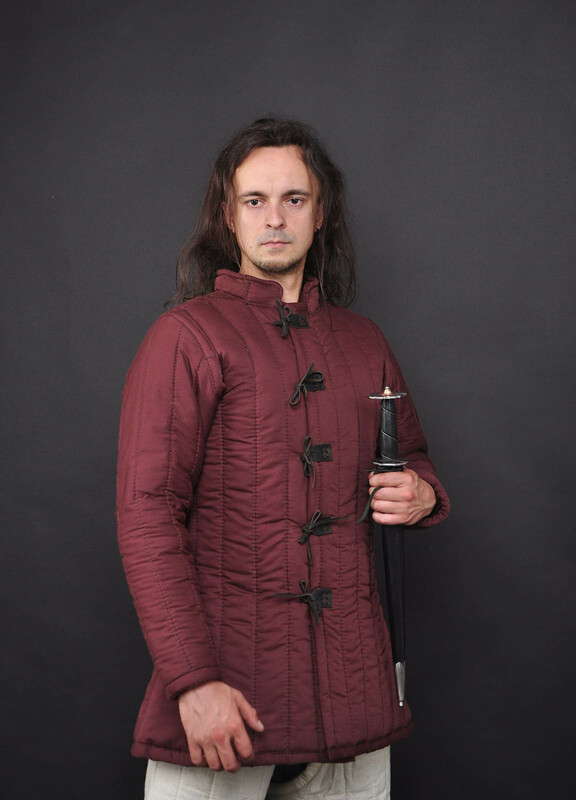 Our medieval gambeson has 3 layers of padding in body and 2 layers of padding in sleeves. 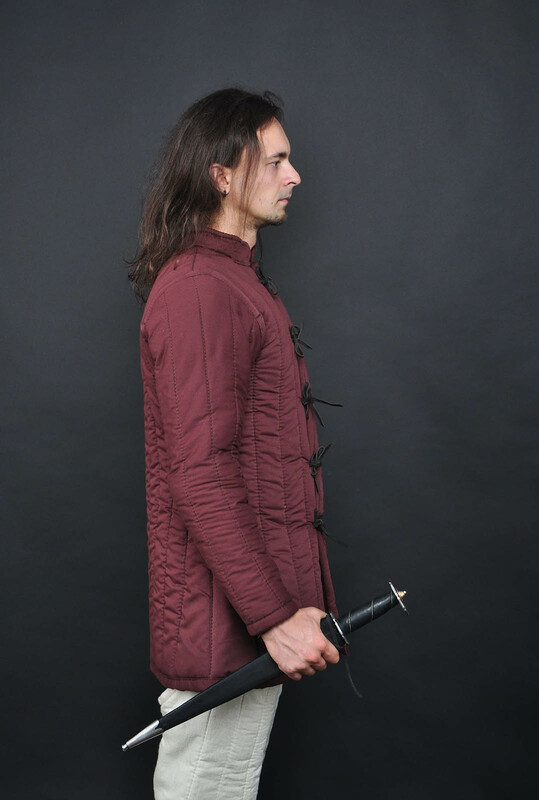 • All materials are 100% natural.• In our gambesons body does not overheat during active training and tournaments• Designed for➝full contact sword fighting➝training weapons fighting➝sca armored combat➝hemaKnights gambeson is perfect for medieval fencing trainings. Men's sizes XS S M L XL XXL Chest 81-87 cm (32-34 in.) 88-94 cm (35-37 in.) 95-102 cm (38-40 in.) 103-109 cm (41-43 in.) 110-119 cm (45-47 in.) 120-129 cm (49-51 in.) Waist 63-69 сm (25-27 in.) 70-77 cm (27-30 in.) 77-84 cm (30,5-33 in.) 86-91 cm (34-36 in.) 92-102 cm (36-40 in.) 102-117 cm (40-46 in.) Hips 81-87 cm (32-34 in.) 88-94 cm (35-37 in.) 95-102 cm (38-40 in.) 103-109 cm (41-43 in.) 110-116 cm (44-46 in.) 117-124 cm (47-49 in.) .. Typical features of men's cotardie are tight fit and a lot of buttons. This model of cotardie is made according to the historically correct patterns. It has stand-up collar, 10 buttons from the front and 6 buttons on each sleeve for fastening. This cotardie has: - Outer side is red wool. - Inner side is red linen. - Height: 182-190 cm - Chest: 95.5 cm - Waist up to: 75.5 cm - Hips: 92.5 cm - Hand length: 65 cm ..